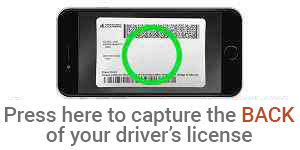 Take an image of the BACK of your U.S. ID or upload a file if you are using a computer. Please provide new verbiage here: We're sorry you have declined to use our online application. Please give us a call at 800.290.1112 and our representatives will gladly assist you.